2 cats and a baby: 400! "This is my 400th post!!" Second, thank you to everyone who reads and leaves comments or emails/calls me with wonderful words of encouragement on how much they enjoy reading my blog. Its really a good feeling knowing that not only am I logging some memories down for our little family but that you are enjoying it as well. No more umbilical cord! A cute little belly button! I am feeling so much better which means more household activities for Alison, like helping make breakfast. The commissary unfortunately doesn't have quite the selection California had when it comes to organic food but we found this pancake mix! Alison helped set the table by putting her own plate and fork on her place mat! I cut up the strawberries at the table so Alison could watch. Yumm yumm pancakes and strawberries! Alison has two oral medicines she has to take, one in the morning and one before bed. Whenever we give it to her we make a big deal about it being in a tiny cup and use silly voices, it makes taking medicine a bit more fun. Little brother enjoying the baby swing. Alison (all cleaned up and ready for the day!) watching little brother from the glider chair. She really enjoys watching him in the swing and calls the glider chair her swing. 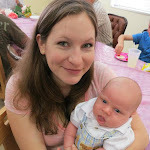 I am feeling really good and Ethan is almost two weeks old (can you believe it!) so I thought it would be nice to go outside. I got Alison's outside stroller out of the front closet (its pretty big, we also keep the big stroller and a bunch of other stuff in there) and she was thrilled to push it around. We walked out to the playground and did several laps around the play structure pushing our babies. I wish we had a walking trail like Grandma Carolyn and Grandpa Frank! Our base is really small so there really isn't anywhere to walk other than the little playground, and I would much prefer something a bit more natural than a playground. I think after my car gets fixed we will have to drive over to Camp Lester, I hear they have a walking/jogging trail. Alison is a really good little mommy! She is also fast making it really hard to get a good picture! Still reading my book, I was able to finish the first chapter and start the second! I am really enjoying the revised edition. I have forgotten so much about the book and its really refreshing to read about how children all develop at their own pace and that no matter what you do as a parent your child is an individual and some of what they do is just apart of their personality. It also has a section that emphasizes not feeling guilty and that no parent is perfect. I really needed to read that! Alison has been trying my nerves, I am sure you cant tell from the pictures but she has been pretty difficult to deal with lately. She is throwing temper tantrums and testing her limits, and the whining! Oh its enough to drive us a bit crazy. I have been gritting my teeth and putting on my nice mommy face, using my gently voice and trying to redirect and when that doesn't work I walk away from the situation. I am really trying to be understanding of all the changes Alison has been going through and she does isn't misbehaving all the time but a lot more than normal! and combined with a new baby its a lot to handle. Prayers for patience and for Alison's happiness would be appreciated! Maybe when I get to the section of my book about behavior problems I'll get some more insight on what to do!